Blue Vertical blinds are synonymous with cool harmony. Browse our Vertical blinds and get an idea of what’s possible. You’ll see light and dark designs, shades such as navy, denim, indigo, cobalt and more. All the tones from the sea and the sky. There are plenty of plain designs to pick from. And of course, there’s a wonderful selection of patterned blue Vertical blinds too. You’ll find blue Vertical blinds decorated with subtle stripes, abstract patterns and gentle textures. 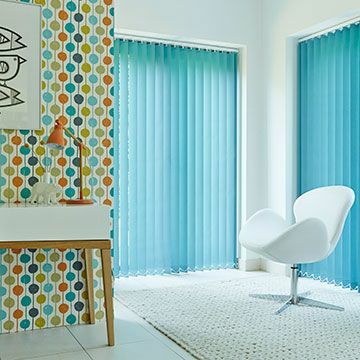 Our blue Vertical blinds range offers a wealth of stylish options. It also features some highly practical fabrics. You can pick from water resistant, Teflon coated, flame retardant and light reflective fabrics. With Hillarys, you’ll find it’s refreshingly simple to choose the perfect blue Vertical blinds. Book an in-home appointment and a Hillarys advisor will bring our entire blue Vertical blinds collection to you. You’ll have a chance to see how the designs look alongside your furniture and décor. And your advisor will be there to give you all the help and tips needed to make the right decision. 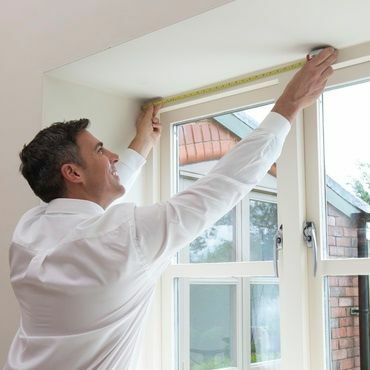 Your advisor will also measure up and give you a no-obligation quote.